Amish tend to be very law-abiding and exhibit low levels of crime. One thing that sets the Amish apart from non-Amish society is their reluctance and often outright refusal to get involved with legal matters. This is manifested most visibly in the Amish approach to litigation. Amish believe that bringing litigation in a court of law violates their understanding of nonresistance. They view litigation as a coercive means and thus counter to their beliefs against using violence. Amish believe in the message Jesus Christ delivered in the Sermon on the Mount: “resist not evil, but whoever shall smite thee on they right cheek, turn to him the other also” (Matthew 5:39). The see this message applying not only in physical matters, but also in the use of institutional means construed as coercive. This is why Amish refuse to initiate lawsuits to protect themselves, for example, when losing out on a business deal, or why they refuse to join unions. When unwillingly involved in court cases, they may offer only passive responses. 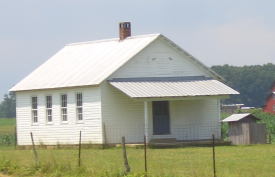 When put in the position of defending themselves, for example, Amish often respond with silence, a demonstration of this same Christian principle. While individual Amish do not sue to protect their own material interests, in matters of religious issues and moral conscience they are more likely to give consent to court action. Examples of this include the landmark 1972 Wisconsin vs. Yoder Supreme Court case, which granted Amish the right to remove their children from schooling after the eighth grade. 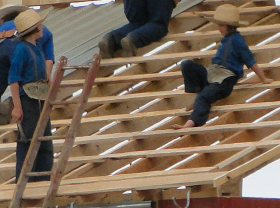 Groups of Amish have also been involved in lawsuits in recent cases regarding cattle tagging and building codes, relying on religious beliefs arguments in arguing their sides. In such cases outside bodies act on behalf of the Amish, including the ACLU and the Becket Fund for Religious Liberty. On the other hand, the occasional Amish who have initiated suits in attempt to gain financial compensation when suffering business or investment losses have typically been pressured by their communities into withdrawing their suits, as in a recent financial scheme in Lancaster County. The reluctance to bring the law to force in court also extends to enforcement of the laws. While Amish generally obey all laws that do not infringe upon their religious beliefs, they never serve as police officers or in other positions of law enforcement. They traditionally view the use of force as wrong, and see direct participation as enforcers of the law as un-Christian. At the same time, Amish pray for those that serve in these positions, and generally cooperate with law enforcement in criminal matters. Controversy has occurred in instances where crimes were committed in Amish communities when disciplinary action was taken in the context of the church, rather than reporting violations to law enforcement. Reluctance to report crimes likely stems from the Amish view of themselves as separate from the world, and from their particular interpretation of Two Kingdoms doctrine. This occurred, for example, in 2009 in an abuse case in a Missouri Amish settlement, in which some ministers and bishops knew of a sexual abuse committed by one of their members but failed to report it to the law. Some have alleged widespread domestic abuse among Amish, due in part to this reluctance to involve the law. However, there is little concurring evidence that abuse rates among Amish are higher than those in the general population. The Amish approach to the law is somewhat complicated. The Amish are law-abiding, with low levels of crime, and generally cooperate when criminal matters arise involving their communities. At the same time, they are typically reluctant to actively involve the law, particularly in order to protect their financial interests through lawsuits. They sometimes even fail to alert law enforcement to protect themselves from harm, as in the case of numerous instances of harassment from local non-Amish in their communities. While Amish do not serve in law enforcement, and view use of force as wrong, they nevertheless do rely on police protection and are grateful to those that do the work to provide them with a safe environment in which to live. Amish beliefs on law enforcement and litigation are ultimately rooted in their founding belief of nonresistance, found in the Dordrecht Confession, and undergirded by their interpretation of Two Kingdoms Doctrine. 1 responses to Why don’t Amish sue? The Amish not suing is the opposite of “Louisville Slugger Lawsuit Settled For $14.5 Million”. A boy has brain damage because he was hit in the chest by a ball when he was a pitcher, and his heart stopped. The ball had been batted with a youth aluminum bat. The boy is not Amish. Lawsuits also increase the cost of medical malpractice insurance. Leave a reply to Why don’t Amish sue?